With five drawers to keep your home organized you will love this storage cocktail table. 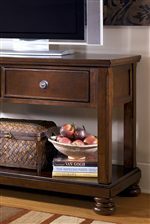 Its classic look with a rustic feel shows in the cherry veneers over hardwoods solids with a burnished brown finish. 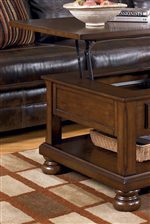 Turned bun feet, framed drawer fronts, and dark bronze color knobs complete the versatile appeal for this coffee table for your living room or family room. The Porter Storage Cocktail Table with 5 Drawers by Signature Design by Ashley at Beck's Furniture in the Sacramento, Rancho Cordova, Roseville, California area. Product availability may vary. Contact us for the most current availability on this product. Storage BOTTOM DRAWER (2) 20 1/2 X 15 1/2 X 3 3/4" L/R TOP DRAWER 9 7/8 X 15 1/2 X 3 3/4" MIDDLE TOP DRAWER 18 1/2 X 15 1/2 X 3 3/4"